Background: Major depressive disorder (MDD) is one of the most common psychiatric disorders. Trigeminal nerve stimulation (TNS) is a novel neuromodulation technology with impressive initial results in the treatment of MDD that lacks a better evaluation of neurobiological mechanisms of action. Methods/Design: This is a two-arm, randomized, double-blind, sham-controlled trial to evaluate the effect of TNS on severe MDD through quantitative electroencephalography (QEEG) pre and post intervention. Forty-four patients diagnosed with severe MDD will be randomly assigned to either a 10-session treatment protocol of real TNS or a 10-session treatment protocol of sham TNS. Outcome measures will be evaluated at baseline, at the end of the stimulation protocol and 30 days after the end of the 10-day treatment period. The primary outcome is changes in the previously established frequency band ranges in QEEG during resting state. The secondary outcome is heart rate variability for better evaluation of the sympathetic and parasympathetic changes after TNS. Discussion: Due to the high prevalence of MDD, the limited effect of antidepressant medications, the high rate of intolerable adverse events, and the high rate of refractoriness, we believe non-invasive neuromodulation strategies, e.g., TNS can be a useful tool for the treatment of MD. The evaluation of the effect of TNS with QEEG before and after stimulation may help us clarify the mechanisms involved in the clinical responses. Trial registration: ClinicalTrials.gov identifier: NCT02562703, registered on 25 September 2015. Ethics: This study protocol has been approved by the institutional review board (IRB) (approval number: 30960814.7.0000.5479) and will be performed in accordance with the Declaration of Helsinki. Informed consent: Patients will sign an informed consent prior to participation in the study. Major depressive disorder (MDD) is one of the most common psychiatric disorders, with a lifetime prevalence of approximately 15%. In the United States, the mean 12-month prevalence is approximately 7%, higher between 18 and 29 years and 1.5 to 3 times more common in women. Limited access to treatment and high rates of refractoriness expose MDD patients to complications, such as drug abuse and suicide ideation. Even though the therapeutic effects of pharmacological interventions have been enhanced during the past years, complete remission rates are still low. In the STAR*D study (Sequenced Treatment Alternatives to Relieve Depression), authors reported the limited efficacy of antidepressant medications, with a 70% remission rate after 4 levels of treatment, in which patients had been exposed to three antidepressant strategies with remission (Rush et al., 2006; Gaynes et al., 2008). Apart from the low remission rate, the presence of adverse events with antidepressants, such as weight gain, sexual dysfunction, gastrointestinal symptoms, changes in sleep cycle and diurnal sleepiness is an important issue when treating patients with MDD (Papakostas, 2008). The occurrence of side effects limit the treatment efficiency with antidepressant medication, leading to discontinuous treatment (Rush et al., 2006). STAR*D study showed an increasing rate of intolerable adverse events and dropout rate from 16.3% and 28.1% at the first level to 30.1% and 42.3% and at the fourth level, respectively (Rush et al., 2006), despite researchers attempt to minimize it (Barbui et al., 2008). The limited efficacy, low remission rates, and high incidence of intolerable adverse events make researches on MDD treatment highly necessary. Depressive symptoms and emotions regulation are related to specific cortical and subcortical regions, such as the dorsolateral prefrontal cortex (DLPFC), the prefrontal medial cortex, the anterior cingulate gyrus, the amygdala, the hippocampus, the parahippocampal gyrus, the hypothalamus, the thalamus, the insular cortex, the temporal anterior lobe and the orbitofrontal cortex (George et al., 1994, 1995, 1997, 1998; Ketter et al., 1996). Studies on neuroimaging have showed a reduction of the frontal lobe volume in patients with severe MDD, when compared with healthy controls (Coffey et al., 1993). Abnormalities in the prefrontal lobe in primary and secondary depression (George et al., 2002a) with reductions on metabolism of the left dorsolateral prefrontal cortex (DLPFC) have been reported (Baxter et al., 1985). Changes in pre- and post-treatment blood flow were also reported, with symptoms amelioration related to an increase in blood flow in the left DLPFC and the anterior cingulate gyrus (Bench et al., 1995). These findings enable the development of neuromodulation techniques to help restore the function of the DLPFC, which is usually hypoactive in MDD (George, 2002). Trigeminal nerve stimulation (TNS) is a novel neuromodulation technology, which is described recently for neurological and psychiatric disorders such as epilepsy and MDD. It is hypothesized that the use of electrical stimulation over the supraorbital branch of the trigeminal nerve could modulate cortical and subcortical areas related to neuropsychiatric disorders (George et al., 2002b; Fanselow, 2012), called the bottom-up mechanism, in which the stimuli propagates from the cranial nerve in the direction of the brainstem and central areas (Pilurzi et al., 2016). TNS was first described for the treatment of resistant epilepsy disorder patients (DeGiorgio et al., 2006, 2013), and subsequently for MDD by Schrader et al. (2011) and Cook et al. (2013) in open-label trials. Following the initial results, an open-label trial performed by Shiozawa et al. (2014b) investigated the use of TNS for 11 patients (mean age of 50.36 years) with MDD in 30-minute session for ten sessions during 2 weeks with a continuous stimulation for 30 minutes, and great improvements were found in depressive symptoms, with a mean reduction of 5.72 points in 17-item Hamilton Depression Rating Scale (HDRS-17). All patients presented with a reduction of at least 50% of the depressive symptoms and ten patients (90.9%) presented with remission of depressive symptoms as defined by less than eight points in HDRS-17. In sequence, a randomized, double-blind, sham-controlled study involving 40 patients (mean age of 47.15 years) with 20 patients in each group conducted by the same group showed that TNS was well tolerated with no severe adverse events. As TNS has a therapeutic effect on MDD, it was successfully applied for patients with other mental disorders: posttraumatic stress disorder (Trevizol et al., 2015d; Cook et al., 2016), panic disorder (Trevizol et al., 2016c), generalized anxiety disorder (Trevizol et al., 2015c), irritable bowel syndrome (Trevizol et al., 2015a), fibromyalgia (Shiozawa et al., 2014a; Grigio et al., 2015), attention-deficit/hyperactivity disorder (McGough et al., 2015), social anxiety disorder (Trevizol et al., 2016b) and MDD in a pregnant patient (Trevizol et al., 2015b), with no unexpected consequences for the child-birth or the newborn. An open-label trial performed for the treatment of MDD in an elderly population got great clinical results and no severe adverse events were reported (Trevizol et al., 2016d). TNS has shown no skin lesions or deterioration of cognitive functions (Shiozawa and Cordeiro, 2015; Trevizol et al., 2016a). This promising, safe and easy-to-use new neuromodulation technique could be a useful tool for the treatment of psychiatric disorders. Despite recent studies on TNS for psychiatric disorders, data on its neuromodulatory mechanisms is still scant. The clinical benefits reported are based on empirical hypothesis and efforts to clarify the involved mechanisms are necessary. Quantitative electroencephalography (QEEG) is an analysis of the digitized electroencephalography that enables visual interpretation. It can be used to evaluate brain function and track the pre-post-treatment changes. The use of independent component analysis (ICA) and low resolution electromagnetic tomography (LORETA) can map the sources of the cortical rhythms. Studies on the effect of TNS on QEEG remain scarce (Axelson et al., 2014; Shiozawa et al., 2016) and inconsistent. Thereby further studies are necessary to better understand the effects of this promising technique on brain function. The main objective of this study is to evaluate the effect of TNS using QEEG in patients with severe MDD. This is a two-arm, randomized, double-blind, controlled trial. Forty-four patients diagnosed with severe MDD will be randomly assigned to either: 1) a 10-session treatment protocol of real TNS, or 2) a 10-session treatment protocol of sham TNS. Outcome measures will be evaluated at baseline and 1 month after the end of treatment. The present protocol has been approved by the Institutional Review Board (IRB) (approval number: 30960814.7.0000.5479) and adheres to the Declaration of Helsinki. The study will be conducted at a specialized outpatient program for MDD at Santa Casa de Sγo Paulo, Brazil. Patients will be included in this trial if they meet the following criteria: (1) Diagnostic and Statistical Manual of Mental Disorders Fifth edition (DSM-5) diagnosis of MDD; (2) age between 18 and 55 years old; (3) right-handed and able to write, read, and understand all elements of the study; (4) HDRS-17 score > 20; (5) 12 weeks of adequate antidepressant treatment prior to evaluation; (6) agreement to participate and willing to give informed consent. Patients with any of the following will be excluded from the study: (1) prior history of head injury or epilepsy; (2) body metallic implants and pacemaker; (3) current use of psychotropic drugs (except for antidepressants on a stable dose for at least eight weeks); (4) pregnant or breast-feeding; (7) indication of hospitalization; (8) substance dependence except for nicotine and caffeine (9) other psychiatric disorders except for anxiety disorders; (10) personality disorders; (11) suicidal ideation; (12) non-controlled clinical comorbidities; (13) MDD with psychotic or catatonic features. Patients will be withdrawn from the study if: (1) pregnancy; (2) complications that influence therapeutic effects and safety judgment occur; (3) upon the request of the sponsor for safety reasons; (3) any change of the pharmacological protocol; (4) presence of psychotic or manic symptoms; (5) failure to complete three consecutive TNS sessions. STATA 13 software will be used for sample size calculation. This study will use a level of significance of α = 0.05 for main hypothesis testing, an expected effect size of 0.33 as reported in our previous studies and a power of 80%. Sample size will be calculated using the log-rank test. The total sample size required is 44 subjects with 22 subjects in each group. Patients will be evaluated: gender, age, educational status, religion, social status, working status and monthly income, clinical comorbidities, use of previous and current antidepressant medications, time since diagnosis, duration of present episode of MDD, number of previous episodes of MDD, family history of psychiatric disorders. Patients will be evaluated using the following scales for symptoms assessment: HDRS-17, Hamilton Anxiety Rating Scale (HAMA), Beck Depression Inventory (BDI), Beck Anxiety Inventory (BAI), Beck Hopelessness Inventory (BHI), Pittsburgh Sleep Quality Index (PSQI), Somatic Symptom Inventory (SSI), and Screening for Somatoform Disorders (SOMS-7). Patients will be evaluated at baseline, at the end of the stimulation protocol and 1 month after the end of the 10-day treatment period. A randomization with four patients per block will be conducted with a 1:1 allocation using the website www.random.org. Participants will be randomly assigned to one of the two treatments: group 1 for active TNS and group 2 for sham TNS. All participants and study staff will be blinded to treatment allocation with exception of the professionals providing the TNS treatment and one researcher not related to this study responsible for allocation concealment. The allocation sequence will be concealed and sequentially numbered in dark, sealed and stapled envelopes and locked in a key protected cabinet file. The envelopes will be opened after 1-month follow-up period. Patients will be recruited from the Major Depressive Disorder Service and the Psychiatry Emergency at Santa Casa School of Medical Sciences, Brazil. Evaluation according to the eligibility criteria will be carried out by two trained psychiatrists. During the interview, the patients will be informed about the details of the study and invited to participate. In the case of their acceptance, an IRB written informed consent will be obtained. Stimulation will be performed using the Neurodyn II (Imbramed) equipment provided by the national regulatory agency. The following parameters will be used: 120-Hz frequency, 250-μs pulse duration for 30 minutes of continuous stimulation. The intensity will be determined individually, corresponding to the intensity that each subject refers as a non-painful mild paresthesia without muscle contraction. The 25 cm2 electrodes will be positioned over supraorbital foramen. Regarding sham protocol, the device will automatically turn off after 60 seconds of stimulation without the knowledge of the patient. After this initial period, the referred paresthesia seems to be diminished due to nerve accommodation. This sham protocol was previously assessed and adequately used as a negative control for TNS (Shiozawa et al., 2015). A total of 10 sessions (one session per day during 10 weekdays) will be performed. Every session will be followed by an interview with a trained psychiatrist to evaluate possible adverse events and guarantee safety issues regarding the study. Study design is summarized in [Figure 1]. Figure 1: Summary of study design. Note: EEG: Electroencephalography; MDD: major depressive disorder; TNS: trigeminal nerve stimulation; EKG: electrocardiography; HDRS-17: 17-item Hamilton Depression Rating Scale; w: weeks. As primary outcome we will evaluate the changes in the previously established frequency band ranges in QEEG during resting state. A comparison between sham and active groups will be performed in three occasions [baseline, at the end of the stimulation protocol (T1) and 1 month after the last day of stimulation (T2)]. EEG acquisition will be performed during daytime, sitting, relaxed, with eyes opened and eyes closed, for 10 minutes each. We will adopt a monopolar montage, with the ears as references, positioned in 21 regions accordingly to the 10-20 system (Fp1, Fpz, Fp2, F7, F3, Fz, F4, F8, T3, C3, Cz, C4, T4, T5, T6, P3, Pz, P4, O1, Oz, O2). EEG acquisition will be performed using the MITSAR-EEG 202 with 24 + 8 channels (Mitsar Co., Russia). EEG and QEEG evaluation will be performed using the WinEEG 2.103.70 and LORETA-KEY and sLORETA softwares. Heart rate variability (HRV): HRV is a safe parameter capable of identifying the sympathetic and parasympathetic systems functions. We will perform electrocardiographic (EKG) acquisition with the subject in sitting position, relaxed, for 10 minutes, using the polychannel EKG from the MITSAR equipment, simultaneously to EEG acquisition. HRV evaluation will be performed using the WinHRV 1.34.15 software for time and frequency domains evaluation. Adequate procedures should be put in place to ensure the integrity, authenticity, and confidentiality of data in accordance with the Study Data Tabulation Model Implementation Guide for Human Clinical Trials (SDTMIG) and the Clinical Data Acquisition Standards Harmonization (CDASH). Statistical analyses will be performed using Stata/SE 13.1 software. All analyses will be performed using the intention-to-treat principle, in which all patients will be included in the analyses using last observation carried forward. The P-value < 0.05 is considered significant. For primary outcome evaluation we will use a general linear model with a continuous dependent variable and two independent categorical variables. The main hypothesis will be considered valid if interaction time and group are not significant. Statistical analysis of secondary outcome will be performed in the same way. Psychiatric and QEEG power band ranges will be analyzed as continuous outcomes. We will control for possible confounding variables on the effect of TNS, such as socio-demographic and clinical characteristics, using logistic regressions. Due to the high prevalence of MDD, the limited effect of antidepressant medications and the high rate of intolerable adverse events, with high rate of refractoriness, we believe that non-invasive neuromodulation strategies can be useful tools for the treatment of MDD. The evaluation of the effect of TNS with QEEG before and after stimulation may help us to clarify the mechanisms involved in the clinical responses. Participants are currently being recruited for the present study. Axelson HW, Isberg M, Flink R, Amandusson A (2014) Trigeminal nerve stimulation does not acutely affect cortical excitability in healthy subjects. Brain Stimul 7:613-617. Barbui C, Furukawa TA, Cipriani A (2008) Effectiveness of paroxetine in the treatment of acute major depression in adults: a systematic re-examination of published and unpublished data from randomized trials. CMAJ 178:296-305. Baxter LR, Jr., Phelps ME, Mazziotta JC, Schwartz JM, Gerner RH, Selin CE, Sumida RM (1985) Cerebral metabolic rates for glucose in mood disorders. Studies with positron emission tomography and fluorodeoxyglucose F 18. Arch Gen Psychiatry 42:441-447. Bench CJ, Frackowiak RS, Dolan RJ (1995) Changes in regional cerebral blood flow on recovery from depression. Psychol Med 25:247-261. Coffey CE, Wilkinson WE, Weiner RD, Parashos IA, Djang WT, Webb MC, Figiel GS, Spritzer CE (1993) Quantitative cerebral anatomy in depression. A controlled magnetic resonance imaging study. Arch Gen Psychiatry 50:7-16. Cook IA, Abrams M, Leuchter AF (2016) Trigeminal Nerve Stimulation for Comorbid Posttraumatic Stress Disorder and Major Depressive Disorder. Neuromodulation 19:299-305. Cook IA, Schrader LM, Degiorgio CM, Miller PR, Maremont ER, Leuchter AF (2013) Trigeminal nerve stimulation in major depressive disorder: acute outcomes in an open pilot study. Epilepsy Behav 28:221-226. DeGiorgio CM, Shewmon A, Murray D, Whitehurst T (2006) Pilot study of trigeminal nerve stimulation (TNS) for epilepsy: a proof-of-concept trial. Epilepsia 47:1213-1215. DeGiorgio CM, Soss J, Cook IA, Markovic D, Gornbein J, Murray D, Oviedo S, Gordon S, Corralle-Leyva G, Kealey CP, Heck CN (2013) Randomized controlled trial of trigeminal nerve stimulation for drug-resistant epilepsy. Neurology 80:786-791. Fanselow EE (2012) Central mechanisms of cranial nerve stimulation for epilepsy. Surg Neurol Int 3(Suppl 4):S247-254. Gaynes BN, Rush AJ, Trivedi MH, Wisniewski SR, Spencer D, Fava M (2008) The STARFNx01D study: treating depression in the real world. Cleve Clin J Med 75:57-66. George MS (2002) New methods of minimally invasive brain modulation as therapies in psychiatry: TMS, MST, VNS and DBS. Zhonghua Yi Xue Za Zhi (Taipei) 65:349-360. George MS, Ketter TA, Parekh PI, Horwitz B, Herscovitch P, Post RM (1995) Brain activity during transient sadness and happiness in healthy women. Am J Psychiatry 152:341-351. George MS, Huggins T, McDermut W, Parekh PI, Rubinow D, Post RM (1998) Abnormal facial emotion recognition in depression: serial testing in an ultra-rapid-cycling patient. Behav Modif 22:192-204. George MS, Ketter TA, Parekh PI, Rosinsky N, Ring HA, Pazzaglia PJ, Marangell LB, Callahan AM, Post RM (1997) Blunted left cingulate activation in mood disorder subjects during a response interference task (the Stroop). J Neuropsychiatry Clin Neurosci 9:55-63. George MS, Nahas Z, Kozel FA, Li X, Denslow S, Yamanaka K, Mishory A, Foust MJ, Bohning DE (2002a) Mechanisms and state of the art of transcranial magnetic stimulation. J ECT 18:170-181. George MS, Ketter TA, Parekh PI, Rosinsky N, Ring H, Casey BJ, Trimble MR, Horwitz B, Herscovitch P, Post RM (1994) Regional brain activity when selecting a response despite interference: An H2 (15) O PET study of the stroop and an emotional stroop. Hum Brain Mapp 1:194-209. George MS, Nahas Z, Bohning DE, Kozel FA, Anderson B, Chae JH, Lomarev M, Denslow S, Li X, Mu C (2002b) Vagus nerve stimulation therapy: a research update. Neurology 59:S56-61. Grigio TR, Shiozawa P, Campos FC, Mathias LA, Cordeiro Q, Perez MV (2015) Trigeminal nerve stimulation (TNS) for fibromyalgia: A proof-of-concept trial. Epilepsy Behav 51:249-250. Ketter TA, Andreason PJ, George MS, Lee C, Gill DS, Parekh PI, Willis MW, Herscovitch P, Post RM (1996) Anterior paralimbic mediation of procaine-induced emotional and psychosensory experiences. Arch Gen Psychiatry 53:59-69. McGough JJ, Loo SK, Sturm A, Cowen J, Leuchter AF, Cook IA (2015) An eight-week, open-trial, pilot feasibility study of trigeminal nerve stimulation in youth with attention-deficit/hyperactivity disorder. Brain Stimul 8:299-304. Papakostas GI (2008) Tolerability of modern antidepressants. J Clin Psychiatry 69 Suppl E1:8-13. Pilurzi G, Mercante B, Ginatempo F, Follesa P, Tolu E, Deriu F (2016) Transcutaneous trigeminal nerve stimulation induces a long-term depression-like plasticity of the human blink reflex. Exp Brain Res 234:453-461. Rush AJ, Trivedi MH, Wisniewski SR, Nierenberg AA, Stewart JW, Warden D, Niederehe G, Thase ME, Lavori PW, Lebowitz BD, McGrath PJ, Rosenbaum JF, Sackeim HA, Kupfer DJ, Luther J, Fava M (2006) Acute and longer-term outcomes in depressed outpatients requiring one or several treatment steps: a STARFNx01D report. Am J Psychiatry 163:1905-1917. Schrader LM, Cook IA, Miller PR, Maremont ER, DeGiorgio CM (2011) Trigeminal nerve stimulation in major depressive disorder: first proof of concept in an open pilot trial. Epilepsy Behav 22:475-478. Shiozawa P, Cordeiro Q (2015) Trigeminal Nerve Stimulation for Clinical Trials in Neuropsychiatry: The Issue of Skin Integrity. J ECT 31:e29-e30. Shiozawa P, da Silva ME, Cordeiro Q (2014a) Trigeminal nerve stimulation (TNS) for fibromyalgia: a case study. Epilepsy Behav 32:100-101. Shiozawa P, Duailibi MS, da Silva ME, Cordeiro Q (2014b) Trigeminal nerve stimulation (TNS) protocol for treating major depression: an open-label proof-of-concept trial. Epilepsy Behav 39:6-9. 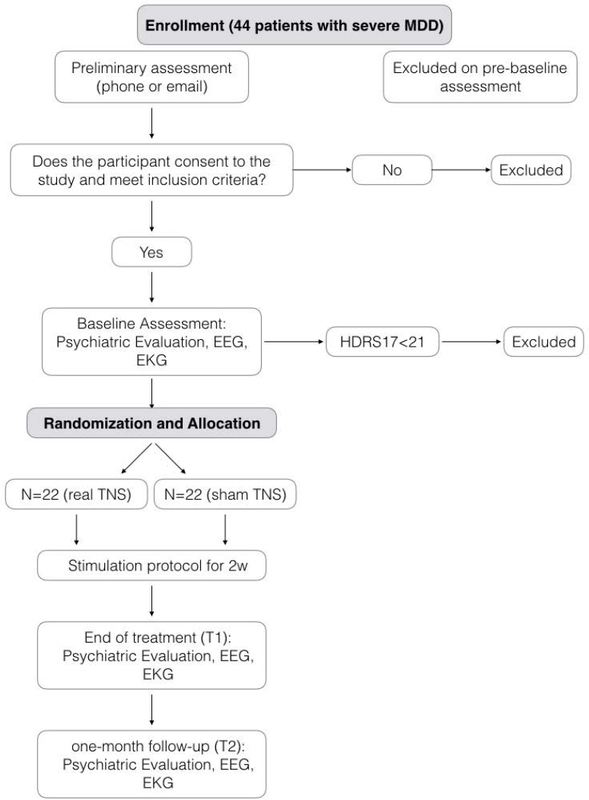 Shiozawa P, da Silva ME, Netto GT, Taiar I, Cordeiro Q (2015) Effect of a 10-day trigeminal nerve stimulation (TNS) protocol for treating major depressive disorder: A phase II, sham-controlled, randomized clinical trial. Epilepsy Behav 44c:23-26. Shiozawa P, Silveira JG, Soares A, Taiar I, Trevizol A, Dias AM, Cordeiro Q (2016) Electroencephalographic changes following a trigeminal nerve stimulation (TNS) protocol: Assessing a novel depression treatment. Epilepsy Behav 58:141-142. Trevizol A, Bonadia B, Gomes JS, Cordeiro Q, Shiozawa P (2016a) Integrity of cognitive functions in trigeminal nerve stimulation trials in neuropsychiatry. Trends Psychiatry Psychother 38:60-61. Trevizol AP, Cordeiro Q, Cook IA, Barros MD, Shiozawa P (2015a) Trigeminal nerve stimulation (TNS) for the treatment of irritable bowel syndrome in an elderly patient with major depressive disorder: a case study. Brain Stimul 8:1235-1236. Trevizol AP, Sato IA, Bonadia B, Liquidato BM, Barros MD, Cordeiro Q, Shiozawa P (2015b) Trigeminal nerve stimulation (TNS) for major depressive disorder in pregnancy: a case study. Brain Stimul 8:988-989. Trevizol AP, Taiar I, Malta RC, Sato IA, Bonadia B, Cordeiro Q, Shiozawa P (2016b) Trigeminal nerve stimulation (TNS) for social anxiety disorder: A case study. Epilepsy Behav 56:170-171. Trevizol AP, Sato IA, Cook IA, Lowenthal R, Barros MD, Cordeiro Q, Shiozawa P (2016c) Trigeminal nerve stimulation (TNS) for panic disorder: an open label proof-of-concept trial. Brain Stimul 9:161-162. Trevizol AP, Shiozawa P, Sato IA, Calfat EL, Alberto RL, Cook IA, Medeiros HH, Cordeiro Q (2015c) Trigeminal nerve stimulation (TNS) for generalized anxiety disorder: a case study. Brain Stimul 8:659-660. Trevizol AP, Shiozawa P, Albuquerque Sato I, da Silva ME, de Barros Calfat EL, Alberto RL, Cook IA, Cordeiro Q (2015d) Trigeminal nerve stimulation (TNS) for post-traumatic stress disorder: a case study. Brain Stimul 8:676-678. Trevizol AP, Shiozawa P, Cook IA, Sato IA, Dos Santos Guimarães FB, Diniz BS, Lowenthal R, Barros MD, Cordeiro Q (2016d) Trigeminal nerve stimulation (TNS) for major depressive disorder in the elderly: an open label proof-of-concept trial. Brain Stimul 9:146-147. The authors certify that they will obtain all appropriate patient consent forms. In the form the patient(s) will give his/her/their consent for his/her/their images and other clinical information to be reported in the journal. The patients understand that their names and initials will not be published and due efforts will be made to conceal their identity, but anonymity cannot be guaranteed. The authors declare no conflict of interest related to the present manuscript. APT was responsible for the neuromodulation parameters and for writing the manuscript. PS and QC designed the trial protocol. All authors approved the final version of manuscript.